In the future electric cars won’t solely be reliant on Lithium Ion batteries, as battery technology and new materials evolve we’ll see the emergence of battery-less electric vehicles. If you ever watch one of my keynotes on the Future of Transportation, like the one I recently presented at GITEX in Dubai, then one of the things you’ll know I discuss is our ability, one day sooner than you think, to 3D print a car using materials capable of generating and storing their own electricity such as carbon fiber, and solar, or photovoltaic, cells and materials. And it’s a vision that’s slowly coming true – after all we’re seeing more 3D printed cars, albeit basic ones emerge, and some companies like BMW and Lamborghini are even talking about wirelessly charged cars, the advent of battery-less vehicles with the latter hoping to build the first prototype, the stunning Terzo Millenio hypercar, in 2030. All that said though this is a journey of a thousand steps, and one of the first steps automotive manufacturers need to take is to integrate renewable energy products with their vehicles, and that’s the step that Hyundai is taking after showing off its latest creation at this weeks SEMA event. Beginning around 2020, it will add solar roof panels to both electrified vehicles and LPG engine models as a way of boosting efficiency. Its solar integration will evolve over time to include a semi-transparent, solar-harvesting sunroof and a solar roof and hood combo. Hyundai Motor Group is showing off its usual small army of high-performance components and concept cars, but it’s also capitalising on the timing to focus on a more serious breed of component not on show in Las Vegas. Its soon to launch solar roofs will help improve efficiency and cut emissions on a select range of Hyundai and Kia vehicles. They will feature not only in the growing electric and hybrid lineup, but also in purely gas vehicles, directly charging batteries and cutting the workload on the internal combustion engine (ICE). 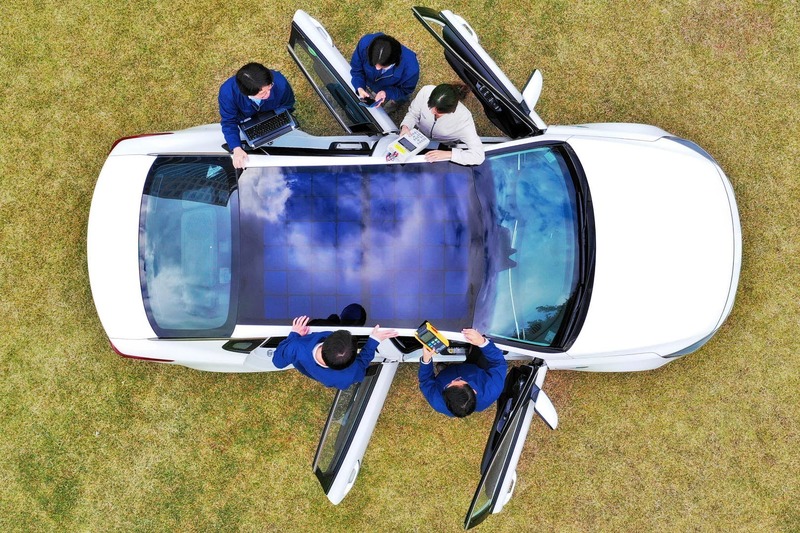 Hyundai announced a three stage deployment, the first stage of which will see mass-produced silicon solar panels mounted onto the standard roofs of hybrid vehicles. 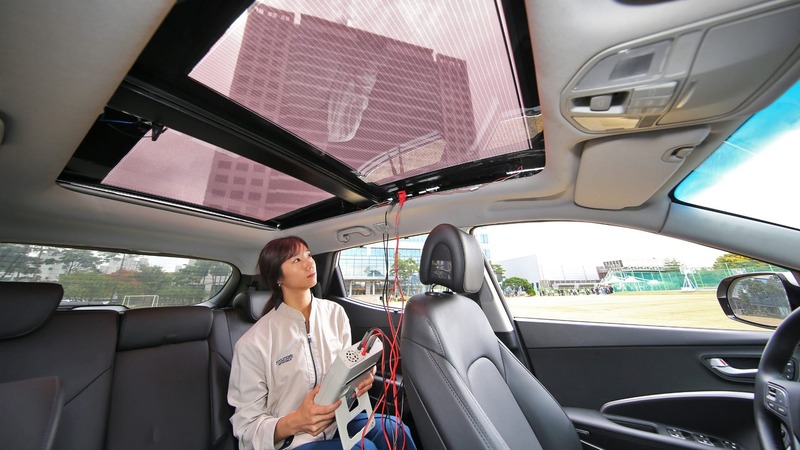 Hyundai estimates that these panels will be capable of charging the battery between 30 to 60 percent per day, depending upon weather conditions. The second stage will represent a more dramatic step forward – applying a semi-transparent solar roof system to ICE powered vehicles in what Hyundai calls a world first. The panels will charge the main battery or an auxiliary battery included as part of the system while blending more naturally into the sunroof structure. Hyundai expects this strategy to help ICE vehicles meet global emissions regulations, thereby boosting export numbers. The third stage, which is currently the subject of a pilot study, will see fuller integration of solar panels into the vehicle structure, on both the roof and hood. This broadened system will increase solar output across a range of eco-friendly vehicles. Hyundai hasn’t laid out a full timeline for all three stages, but it does say that it intends to launch the first solar roof systems after 2019.